Again. It's up to us. This post comes at an intense time in my life. The oil spill is causing me to question whether or not I will ever have children, and the US continues to pour trillions of dollars into an endless war. Meanwhile, the fight over the sanctity of our food - adulterated and safe to eat - continues on. Right now there are two pressing issues requiring all of us to tap into our willingness to speak out to demand a food system that is free of chemicals and genetically engineeredness. 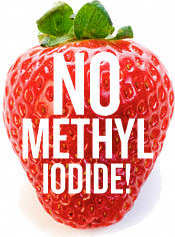 We need to raise our voices to 1) decry Methyl Iodide as a substitute for Methyl Bromide for use on California strawberries, and 2) we need to ensure that the ban on GE alfalfa - one of the major feeds of livestock - is not allowed to be lifted. From now until June 29th, the Governator of California will be accepting comments and letters on the issue of Methyl Iodide - the carcinogenic replacement that being proposed for Methyl Bromide. Pesticide Action Network is doing a great job at garnering attention to this issue and breaks it down why, no matter where you live, this issue is relevant to you. Naomi Starkman wrote a great overview of the issue on Civil Eats and later posted in The Huffington Post. One of my favorite organizations out there, The Center For Food Safety, has long stood ground against the barrage of threats that threaten organic food and happen to be the organization that got me involved in food advocacy. They were founded in 1998 when the USDA was getting into the organic certification business and were considering intolerable allowances under the newly forming "organic" certification such as toxic sludge, antibiotics and other chemical farming techniques. As contamination to non organic crops and grasses is inevitable if its released into the wild, the current ban on GE Alfalfa must not be allowed to expire.